Local business owners remain optimistic about their prospects for the next 12 months, with about twice as many predicting growth as no change and only a small percentage expecting declines. The findings are from the San Diego Business Journal-Cal State University San Marcos Business Confidence Index. 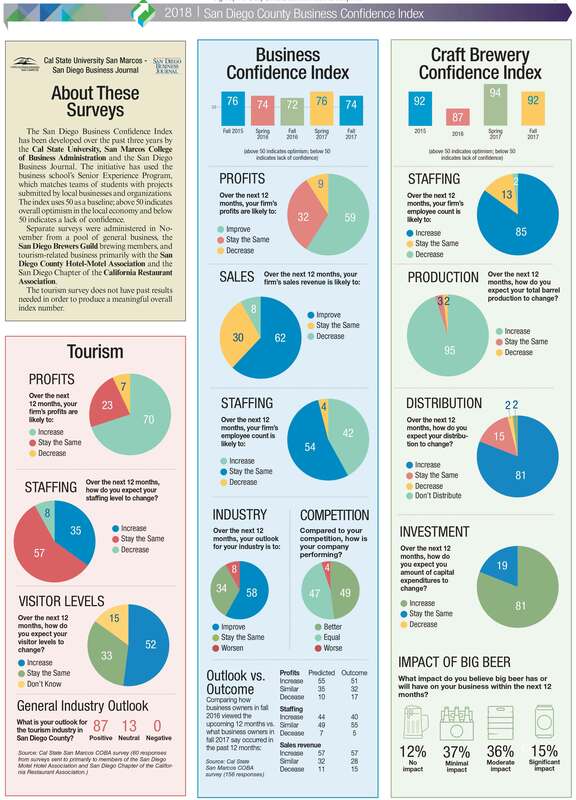 Separate surveys were administered in November among local businesses, craft brewers and tourism-related businesses. The most recent overall business survey produced an index of 74, slightly below the 76 from six months ago but slightly above the 72 from a year ago. The index uses 50 as a baseline; above 50 indicates overall optimism in the local economy and below 50 indicates a lack of confidence. The most recent survey received 156 responses. The surveys were conducted prior to the federal tax reform being signed into law, though various aspects of the tax reform proposals were well publicized when the surveys were conducted. A majority of businesses expect profits and sales revenue to increase in 2018. Some 42 percent expect to increase hiring and 54 expect their staffing levels to remain about the same. Comparing data from a year ago, local business turned out to be remarkably close in their outlooks. In terms of profits, 51 percent of the survey respondents said they had increases in profits in the past 12 months; a year ago 55 predicted an increase in profits. With staffing, 40 percent had increased staff in the past 12 months; a year ago 44 predicted an increase in hiring. For sales revenue, 57 percent reported increases for the past 12 months, matching the predicted outlook. The local craft beer industry remains optimistic about its short-term future with an index of 92. The survey was sent to brewing members of the San Diego Brewers Guild and received 59 submissions. “There are still a lot of breweries in their younger stages – two to three years old – and they see room for growth,” said guild president Jill Davidson, who is sales manager for Pizza Port Brewing Company. “There are still some underserved areas that are excited to welcome breweries.” She cited Lemon Grove, which is getting its first brew pub this spring, and National City. Tourism businesses also expressed optimism for the next 12 months. A majority of firms expect an increase in profits, about half expect more visitors, and a third expect to increase staffing. 87 percent of the responding businesses expressed a positive outlook for the tourism industry in San Diego. This was the first time the tourism survey was administered.